A fire column of elemental power and beauty. Emits cosy warmth all around the terrace. Weather-resistant structural steel with patina finish: Long-lasting beauty without special treatment. Artful steel column with patina. Perfect as a sculpture – and as a fireplace. Eye-catching and wonderfully warm. Suitable for outdoor use all year round. For garden and terrace. 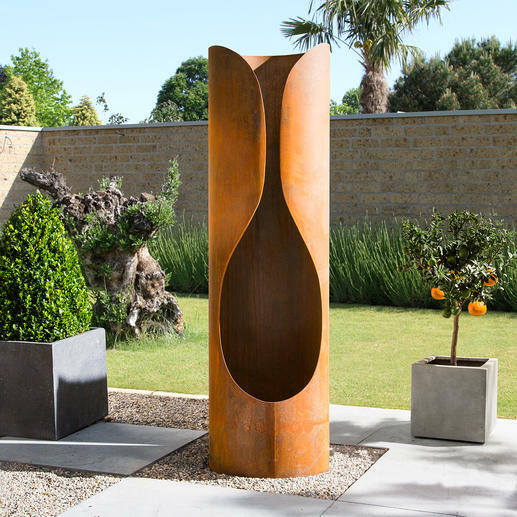 During the day, you can place the distinctive steel cylinder in your garden, in front of a wall or on the patio, where it will look like a modern art installation. The natural patina on each fireplace is unique and only becomes more distinctive and interesting over time. 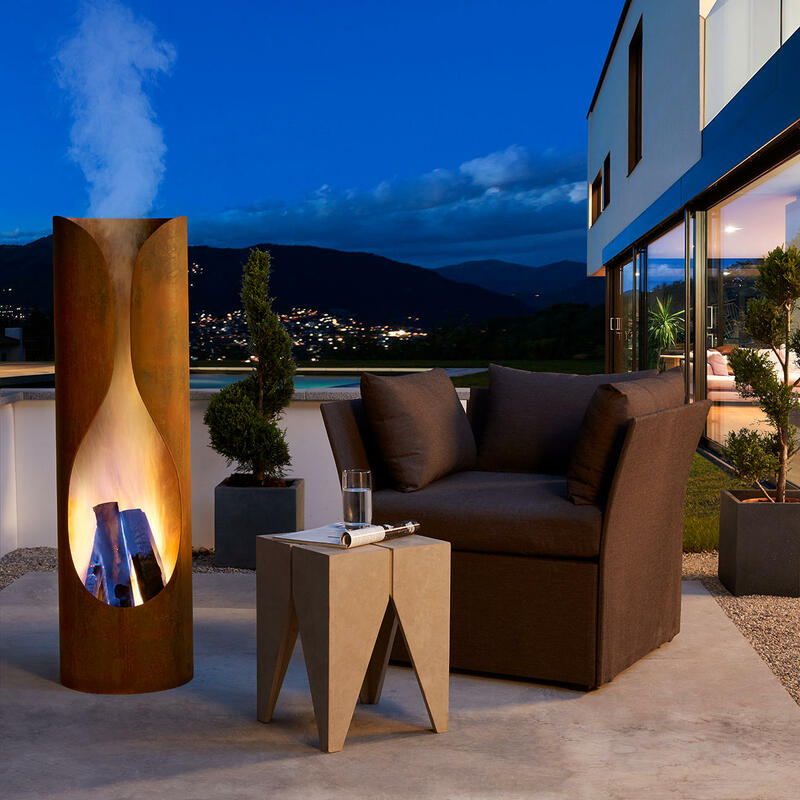 The large, teardrop-­shaped opening at the front accentuates its artistic character whilst being a luxurious outdoor fireplace. Burn firewood in the spacious firebox. Shaped like the vent of a volcano, the large, teardrop-shaped opening offers a great view of the crackling fire. No slow or smouldering fires here as the tall fireplace ensures optimal airflow. Fiery blazing flames dance up and down and create a beautiful interplay of light over the entire column. The colour of the exterior is especially lively as the heat generated causes the rusted COR-TEN steel to darken. During cooling it returns to its original colour. The tall column is ideal for placing in the midst of your terrace, garden etc. Thanks to the large opening, the firewood can be piled up for optimum performance, and makes adding logs easy, even when the fireplace is lit. There’s no need anymore for blankets, and you can enjoy the outdoors for hours on end. 1.6mm thick COR-TEN steel makes the fireplace stable and almost indestructible. Exposed to the weather, a barrier layer is formed on the steel over time, which enhances the precious patina effect and prevents further corrosion. Base plate and column are firmly welded. All edges are carefully smoothed. Size 120cm (47.2") H, 35cm (13.8") diameter. Opening firebox: 29 x 50cm (11.4" x 19.7") (W x H). Weight 15kg (33.1 lbs). We have been using this since it arrived, out on our deck during the evening. It provides a wonderful focus point for a social gathering and also looks beautiful with its sculptural effect when not lit. We did realise in time that if placed on a wooden deck, a stone or slab must be placed underneath to prevent damage from the heat. This has been one of our most successful garden purchases this summer.